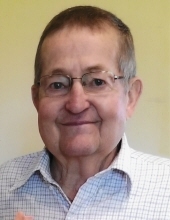 James Nicholas Ruden, 77, of Marcus, Iowa, died on December 3, 2018, at the Cherokee Regional Medical Center in Cherokee, Iowa. Mass of Christian Burial will be 10:30 a.m. Friday, Dec. 7, 2018 at Holy Name Catholic Church in Marcus with Father William McCarthy officiating. Burial will follow in the Holy Name Cemetery in Marcus. Graveside military honors will be conducted by American Legion F.I. Goodburn Post #517. Visitation with family present will be 4-7 p.m. Thursday, there will be a vigil prayer service and Knights of Columbus rosary at 5 p.m. all at Holy Name Catholic Church in Marcus. Jim was born on August 26, 1941, to Arnold Joseph Ruden and Florentine (Schreier) Ruden at Floyd Valley Hospital in LeMars, Iowa. He and his family lived in Remsen, Iowa, until they moved to Marcus in March of 1949. Jim stayed with Frank and Marie Ruden of Remsen to finish out his 2ndgrade class held in St. Mary Convent so he could make his First Holy Communion at St. Mary’s Catholic Church in Remsen on May 8, 1949. In 1959, Jim graduated from Holy Name Catholic School in Marcus. He farmed with his Dad and his brothers. Jim and Diane (Lang) Ruden were united in marriage on September 2, 1968 at St. Mary’s Catholic Church in Remsen, Iowa. They celebrated their 50thwedding anniversary this year. Jim served in the Army National Guard out of LeMars, Iowa, from September 1963 to September 1969. He also served in the Vietnam War from January 1969 until June 1969. He received his Honorable discharge in September 1969. On Jim’s return from Vietnam, he and Diane lived in several locations in Marcus, Iowa before settling down north of Marcus on Highway 143. Jim worked for 14 years at the Marcus Farmers Elevator, and then 19 years at Wells Blue Bunny in LeMars, Iowa. He retired on September 1st of this year. The Knights of Columbus of Remsen and Marcus, and the Catholic Order of Foresters of Remsen honored Jim with 50-year pins. Hobbies of Jim were working, watching westerns and action movies on TV, gardening, making hay, Kentucky Fried-Chicken, and going out to eat with the family. Survivors include his beloved spouse, Diane; 3 children: Laurie Lynne Ruden of Spencer, Iowa, Christine Michelle (Kevin) Massey of Sioux City, Iowa, and Wade Stephen (Mary Ann) Ruden from LeMars, Iowa; 6 grandchildren: Joshua Paul Massey, Allison Nicole Ruden, Jacob James Massey, Sophie Marie Ruden, Julianna Rose Massey, and Tessa Joy Ruden; Siblings: Robert (Vickie) Ruden of Marcus, Richard (Debby) Ruden of Marcus, Margie (Phil) Schroeder of Remsen, Fred (Lois) Ruden of Taylor, Texas, Ronald (Nadine) Ruden of Hinton, Dennis (Bonnie) Ruden of Sioux Center, (Pete) Wendy (Keith) Hauschildt of Marcus, and Kathy Steffen of Marcus; and Mother-in-law Shirley Lang. Jim was preceded in death by his parents, Arnold and Florentine Ruden, his brother Pete Ruden, and Father-in-law Paul Lang. Casket Bearers will be Wade Ruden, Kevin Massey, Josh Massey, Jacob Massey, Roger Ruden & Alan Ruden. To send flowers or a remembrance gift to the family of James Nicholas Ruden, please visit our Tribute Store. Visitation with family present will be 4-7 p.m. Thursday, there will be a vigil prayer service and Knights of Columbus rosary at 5 p.m. all at Holy Name Catholic Church in Marcus. "Email Address" would like to share the life celebration of James Nicholas Ruden. Click on the "link" to go to share a favorite memory or leave a condolence message for the family.